A song to play while you’re reading about the Astros: “Zachariah,” by the Jesus Lizard. It’s a spaghetti Western stalk of inevitability, the soundtrack for a team that can only be contained in the vagaries of small samples. This casual fan may be forgiven for not appreciating McHugh’s mini-resurgence. After a forgettable injury-filled 2017, he moved to the bullpen last season, adding a slider to his repertoire. Over 72 innings his K/9 rose to 11.7, with an impressive FIP (2.72) to pair with a sub-2.00 ERA. Mixed among the many assorted jewels of the Astros pitching staff, his newfound sparkle perhaps didn’t shine as distinctly to a national audience. But now he’s returning to the starting rotation, and this crazy diamond is going to shine on. Trust my gut on this one, because the projections aren’t nearly as bullish. ZiPS forecasts a regression back to his serviceable starter stats: an 8.46 K/9 and a 3.81 FIP over 134 innings. I don’t begrudge the computers this ho-hum attitude: in addition to benefiting from a small sample size in 2018, McHugh’s stats also enjoyed a .248 BABIP, nearly sixty points below his career average. His player comp for 2019 is John Thomson. But many of the recent pitcher upgrades to emerge from the Astros haven’t followed convention. 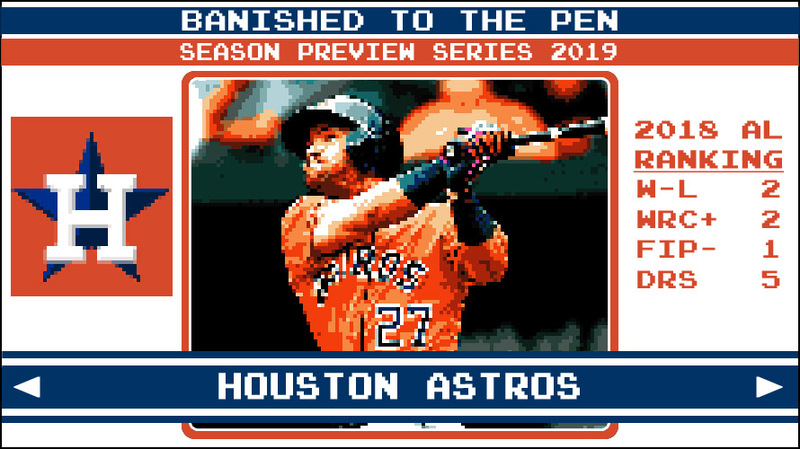 Verlander’s continued resurgence (that began as soon as put on a Houston jersey), Gerrit Cole’s immediate ascension to dominance last season, and the Josh James experience have all been recent testaments to the team’s player development prowess. It has drawn the ire of Trevor Bauer, and it has made casual fans not immediately scoff when they hear the team the Astros have acquired Wade Miley — because maybe, the casual fan ponders, maybe Houston actually sees that something in him no other team does. That something for McHugh in 2018 was the slider. He will ride that pitch in 2019 to newfound success and earn glory — for Houston, his home state of Illinois, and all of us with splotchy skin and guileless smiles. The season, of course, doesn’t start until the games matter. This spring, the Marlins (ed. note: The Marlins!) rocked McHugh for six runs in two and two thirds innings during his third spring training appearance. What I’m saying is please don’t check his spring numbers. Hope springs eternal. Colin McHugh will stand on the top of the heap in 2019! You heard it here, folks. What is the Astros’ most recent accomplishment? The 2018 Astros won 103 regular season games — decisively. They led the majors in run differential (263) and had the lowest runs allowed per game (3.30). After finishing the postseason runners-up for the AL pennant, the Astros stoked the weak hot stove in December by signing outfielder Michael Brantley and catcher Robinson Chirinos, who have been two of the team’s three most notable acquisitions. The third is veteran pitcher Wade Miley, who was signed in February. If the Astros’ offseason is defined by one narrative, though, it seems likely that that narrative will be their unwillingness (or inability) to resign Dallas Keuchel, who as of this writing remains a free agent. How will the Astros define success in 2019? Success for the Astros in 2019 — as farm-fresh talent rises and free agent signings are loaded into the roster — is an American League pennant and another World Series victory. Among minor league talent prepared to emerge on the roster in 2019, right-handed starter Josh James has been found money for the Astros. James, a 34th round pick from 2014 and a constant member of Cistulli’s Fringe Five, had a whirlwind 2018 as he struck out bushels of batter on his rise from AA to the majors, thanks to a newfound velocity on a fastball that tops off at 101. This spring his competition for a spot on the starting rotation has been delayed during spring by a strained right quad. In the Astros’ slate of by-the-books promotional days for 2019, there is one outlier: Orbit’s birthday bash on Sunday, June 9. The giveaway will be a very nice pair of socks branded with the mascot’s indelible face (limit first 10,000). said still in touch with Keuchel?